Coconut water, the clear liquid found in young green coconuts, has become a popular beverage. Coconut milk, often confused with coconut water, is made from the meat of the coconut and is higher in calories and fat. Coconut water contains electrolytes, and is often used to rehydrate after exercising instead of drinking sports drinks. Most sports drinks are high in sugar that may upset your stomach; coconut water, on the other hand, offers a nutty flavor with less sugar. One cup of coconut water contains 46 calories. Carbohydrates make up the majority of the calorie content, with 8.9 grams per 1-cup serving, of which 6.26 grams are from sugar. According to the Centers for Disease Control and Prevention, you need to consume 28 grams of fiber per day, based on a typical 2,000-calorie diet. Coconut water offers 2.6 grams, or 9.3 percent of your daily needs for fiber. Coconut water contains 1.78 grams of protein and less than 1 gram of total fat. Coconut water is a good source of the electrolyte potassium, and provides 600 milligrams per 1-cup serving. Many people drink coconut water instead of a sports drink after vigorous exercise to replace lost electrolytes. Normal potassium levels are necessary for regular cell function. When potassium levels drop too low, it affects your nervous system and can lead to an irregular heartbeat, which can be fatal. Coconut water also contains 252 milligrams per-serving of sodium, which is another electrolyte lost during exercise through sweat. Sodium plays a role in your critical body functions by regulating the movement of water in and out of your cells. The potassium and sodium content found in coconut water make it a smart choice when you become dehydrated, whether from physical activity or sickness when you are experiencing diarrhea or vomiting. Coconut water offers a good source of vitamins making it a nutritious drink option. One serving of coconut water provides 5.8 milligrams of vitamin C, along with folate, riboflavin, thiamin, niacin and vitamin B-6. Coconut water also provides other key minerals including calcium, iron, magnesium, phosphorus and zinc. 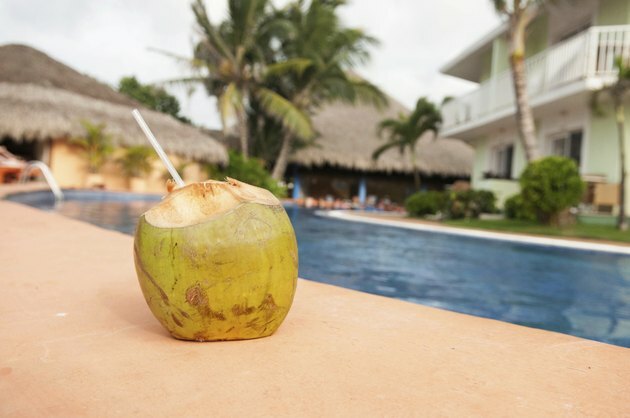 Are There Dangers in Drinking Young Coconut Water Every Day?